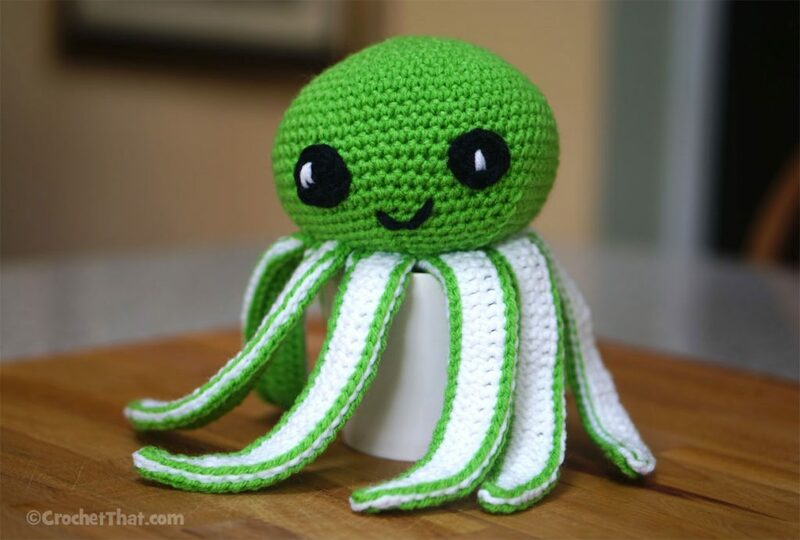 This a Free crochet pattern for the “Ollie the Octopus” crocheted Amigurumi Octopus toy. 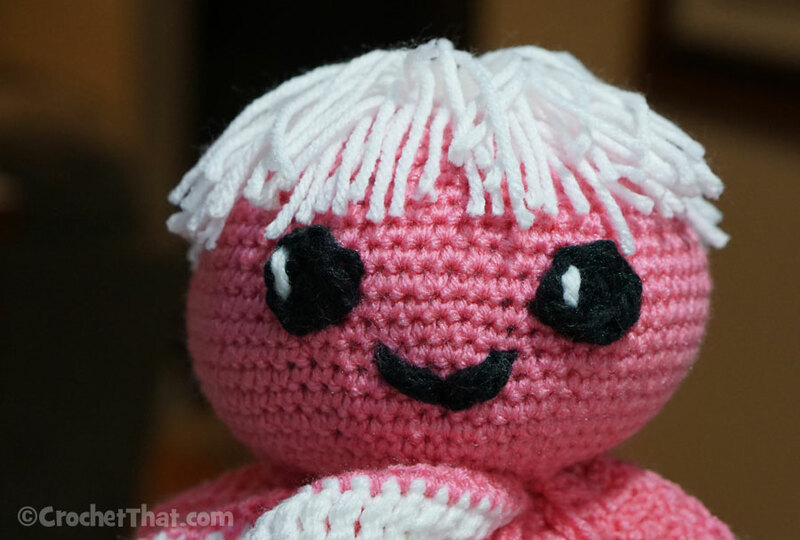 I made Ollie with pink, green and white Red Heart “Super Saver” yarn. You can use whatever yarn you like. I find the Red Heart Super Saver yarn is sturdy and easy to work with for toys like this. It doesn’t take much so you can use scrap yarn you have already in your stash. 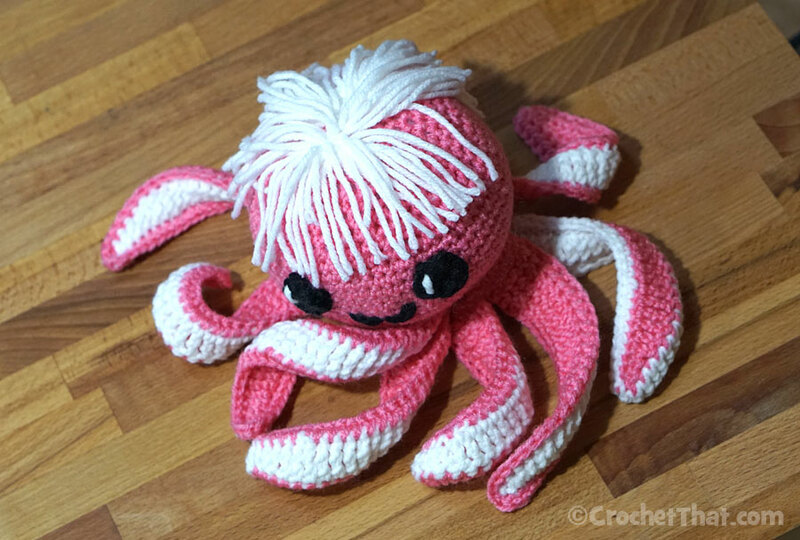 You can make this Amigurumi octopus toy with or without hair. You could add “eyelashes” by using a yarn needle and black yarn and adding stitches to the outer edge of the eyes. I made my octopus a boy for some reason but he could easily be a girl with just minor changes. Which one do you like the best? Pink or Green? Hair or no hair? Boy or Girl Octopus? 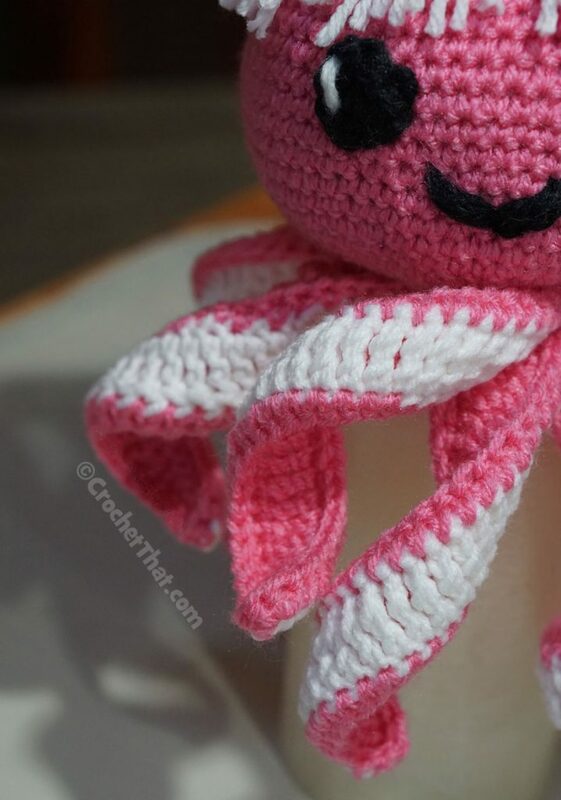 These Free Amigurumi Crochet Octopus Pattern instructions assume you know the basics of crochet. You will need to know how to single crochet, half-double crochet, double crochet, triple crochet, decrease stitches and sew with a yarn needle. I modeled my pattern after the The Friendly Red Fox pattern and added my own modifications and changes as you will see below. How to Decrease (2sctog): begin your sc as normal but inserting the hook through the next stitch, pull the yarn through so you have 2 loops on the hook. Do not complete the sc but put your hook through the next stitch and pull through another loop on your hook. You will have 3 loops on the hook now. Now, yarn over and pull through all 3 of the loops you just added to your hook. 1. With black yarn, work chain 3 and then 5 dc in a magic ring. I like to start with a chain because it makes it easier to add the first stitch; slst in the top of the beginning chain 3. Pull the yarn tail tight to close up the circle. Cut yarn leaving about 10″ to use for sewing the eye to the head and close off. Repeat instructions to make a second eye. 2. Using white yarn, put a knot in one end and thread the yarn through the yarn needle. 3. Bring the yarn up through the back of the eye and then down about 1/2″, following the photo above for placement. Bring it up again and down to make it a bit thicker. Weave the tail into the back of the eye and cut yarn. Foundation Round: with colored yarn of your choice, work chain 1 and then 6 sc in a magic (ring) circle (how to make a magic circle); slst in the beginning sc to close the round. Pull the yarn tail tight to close the gap. Add a stitch marker at the end of the round. Chain 1. Move your stitch marker forward to the first stitch at the end of each round. Stop at this point and sew the eyes and mouth on using the yarn needle. I sewed mine on at the edge of round 17, making sure to leave the bottom edges of the stitches available so I could easily continue with round 18 once the eyes were sewn on. I spaced my eyes about 2″ apart. Stop at this point and begin stuffing the head. Round 26: Chain 1. 2sctog (decrease) in each remaining sc around to close the head. Cut the yarn and use the yarn needle to sew in the tail. White Tentacle: with white yarn, chain 30 and work 1 sc in second chain from hook. Then work 1 hdc, 1 hdc, 1 dc, 1 dc, and 1 trc. Continue with a 1 trc in each of the remaining chains. Cut the yarn, tie off, and weave in the yarn tails. Accent Color Tentacle: repeat the instructions above using the main color yarn that you used for the head. Do not cut the yarn at the end of the row this time as you will use it to sew the two pieces together. Line up the two pieces and sc around the entire piece. Add 2 or 3 sc in the corner stitches to make the turn. Cut the yarn, tie off, and leave a long tail (about 10″ to 12″) to sew the tentacles to the head. Make 8 total tentacles using the instructions above. Sew each tentacle onto the head, as shown below. When you finish making the tentacles you will see that they twist nicely to give them a fun look. You may have to shape them a bit with your fingers to get the twist to really take form the first time. I decided that my octopus need more of a personality. First I was going to make him a girl and give him flashy eyelashes but then the hair just came into being and it worked out perfectly. It’s super easy to make hair and sew it on top of the head. I sewed my hair on when my entire octopus was completed but you could sew it on before you stuff the head if you like. 1. Cut about forty five (45) to fifty (50) 7″ pieces of white yarn (or whatever color you like). 2. Lay the yarn evenly on the top of the head in the center. TIP: If it helps, try to pin the yarn pieces onto the head. I didn’t pin it. I just held them in place while I was sewing. 3. Thread the yarn needle with white thread and put a double knot in one end. Pull the yarn through the head up into the middle of the hair you have placed on the head until you pull the knot is inside of the head. 4. Bring the yarn down into the head and back up, making sure to catch the hair yarn. Continue going up and down until you have a nice row of about 2″ in length. Make sure to catch as much of the hair yarn as possible in the sewing so it can’t be easily pulled out. You can sew in the tail and cut off or continue below to make bangs. 5. Trim the ends of the hair all around so they are even. Bangs: To make the bangs, continue with the white yarn you are using to sew in the hair and bring the yarn needle up right at the center where the hair is attached in the front. Make up and down stitches going outward from the center and making each stitch a little longer. You can put the needle down through the crochet holes and then use the holes as a guide to make the rows longer. Sew the same pattern on the other side of the center hole. You could make the hair one color and the sewing a different color to give it another unique look. 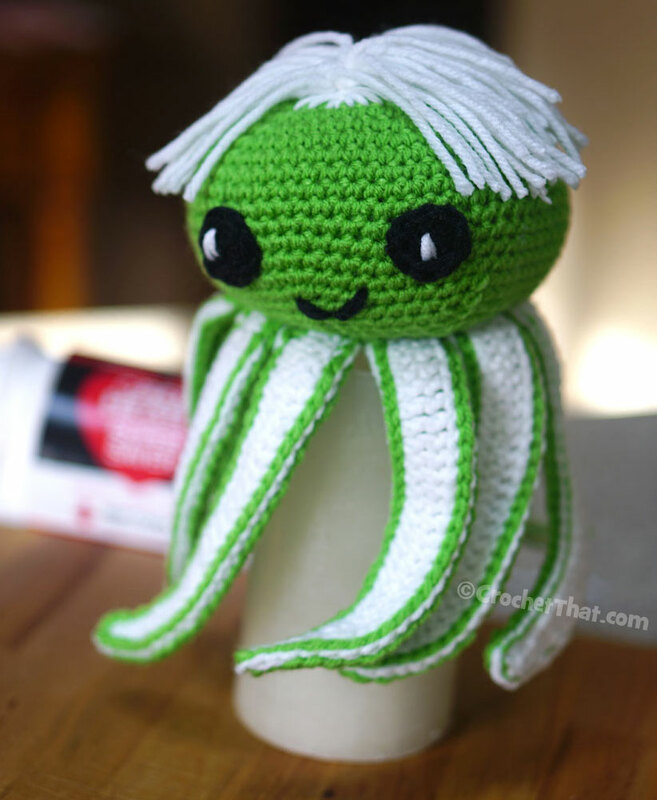 Make the hair white and then sew it on with the color yarn you use for the head and tentacles. I just love this Amigurumi Crochet Octopus pattern and glad I found it. I hope my instructions are clear and make it easy for you to follow. I think this octopus would look neat in either orange or aqua. Here’s another little extra thing I added to my Amigurumi Octopus toy, a heart motif. It’s easy to make a heart motif and it literally takes jut minutes to complete. 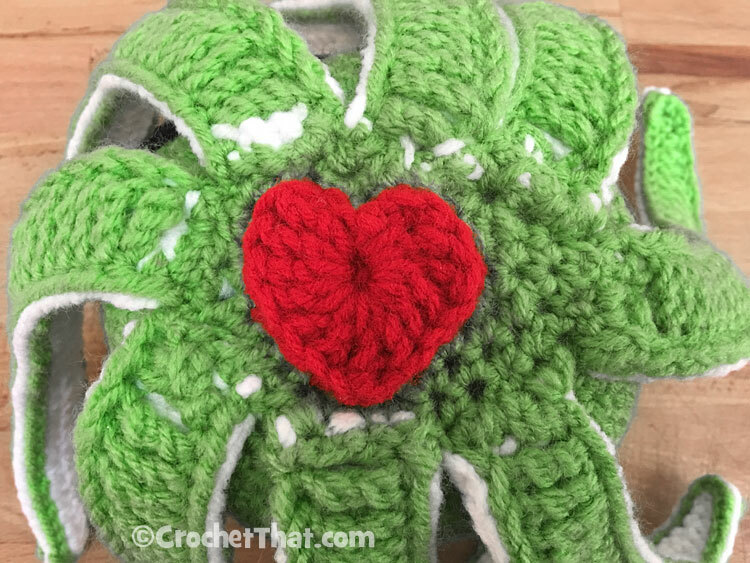 Once you make the heart, just sew it on the bottom – or maybe on one of the tentacles. Foundation: chain 1 in a magic circle. Round 1: Work 3 dc, 1 hdc, 2 sc, 1 dc, 2 sc, 1 hdc, and 3 dc into the the magic circle (ring). Chain 1 and slst into the ring and pull the yarn tail to close the gap. Round 2: Chain 1. Work 1 sc into the chain space before the first dc of the round 1, and then work 2 hdc in each of the next 3 stitches; 1 hdc in the next 3 stitches; hdc and dc in next stitch; dc and hdc in next stitch; 1 hdc in next 3 stitches; 2 hdc in next 3 stitches; slst into the chain space; finish off. Finish: Cut yarn and weave in the yarn tail with a yarn needle.